A dream to ride over the gnarliest MTB terrain. 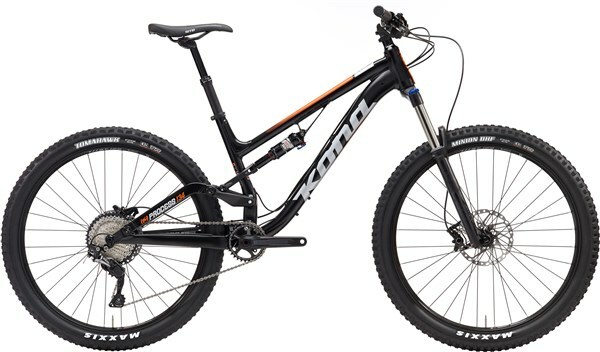 The Kona Process 134 is a short travel full sus trail mountain bike, with 27.5” wheels, that offers the high performance you need to shred every trail on the mountain. Stiff and strong the 6061 aluminium alloy frame is made with butted tubes to keep the weight down. Dialled trail geometry, with a 67 degree head angle, offers stable handling in the rough with an efficient riding position. The Rocker Independent Suspension system offers 134mm of rear wheel travel with a compact low-slung design that offers an efficient peddling platform with a consistent leverage ratio that perfectly matches modern air shocks. This is the same frame that you’ll find on the Process 134 DL. Up front the RockShox Sector fork gives you 140mm of plush suspension control and is paired to the reliable RockShox Monarch RT shock controlling the rear. The Shimano SLX/Deore 1x11 speed drivetrain gives you secure shifting with all the gears you need to ride the whole mountain. Shimano hydraulic disc brakes give you confident stopping power. WTB i29 rims, Maxxis tyres and a KS Eten Integra dropper post round off the spec on this great value trail MTB. Ride every trail on the Kona Process 134.